Tackle paint, adhesives, PU foam, silicone, oil, grease, grime and just about anything else you can get your hands into. 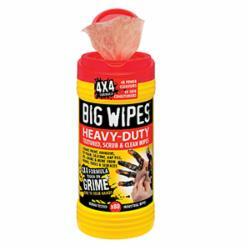 These wipes are dual-sided for the toughest jobs, when you really need to cut through the dirt. Unique canister design allows you to remove one wipe or many wipes - with only one hand. Easy open, easy close and won't trap your fingers.